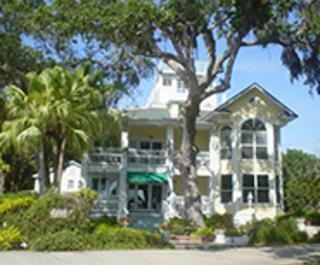 Rated AAA 3-diamonds, the River Lily Inn B&B overlooks the beautiful Intracoastal Waterway and is nestled between draping Oak trees and swaying palm trees on 1 1/2 acres. The historic and majestic 1895 riverfront estate stands five stories tall with the cupola proudly gracing the top. The unique heart shaped pool adds to the charm and ambiance of this beautiful home and is the perfect backdrop for special occasions. Choose from a variety of guest rooms including jetted tubs, skylights, a private Verandah and handicapped accessible room. All units feature a private bath, flat0screen TV, DVD player and wireless Internet. Enjoy a good nights sleep and awaken to a bountiful breakfast! 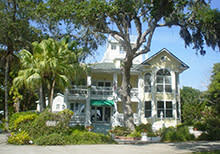 TripAdvisor has awarded the River Lily Inn Bed and Breakfast the "Certificate of Excellence" award every year since the opening of the inn. Only 10% of accommodations worldwide receive this honor.